One side of the Rathbone School is set up as an original one-room schoolhouse. 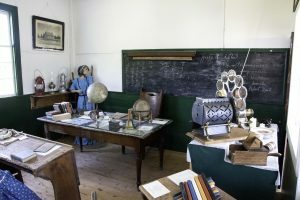 Located in Eagle Harbor, two blocks west of the harbor’s swimming beach, this extensively restored one-room school served the community from 1853 to 1872. The photo above shows the current building as the way the building appeared ca. 1900 with a a tour of guests from the fraternal lodge, The Knights of Pythias. It was in this building that Justus H. Rathbone, who began teaching here in 1860, conceived the idea for the ritual of the Knights of Pythias, a secret fraternal society which he founded. This interdenominational organization, which had a peak membership of a quarter-million, continues to conduct its charitable work today across North America. The school has long been an object of pilgrimage by society members. In 1931, a thousand members gathered to pay homage to their society’s founder and to witness the unveiling of the nearby granite monument in honor of Justus Rathbone. 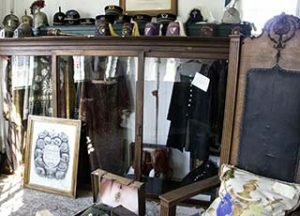 The other side of the Rathbone School contains regalia and memorabilia commemorating the Knights of Pythias. Hours & Admission -The Rathbone school and museum is open mid-June to early October.There is no admission charge for this museum however a donation is appreciated. Related Links – You may wish to explore the following web sites for additional information on the Rathbone School and the Knights of Pythias.